Daiya and Please Like Me TONIGHT! It’s an exciting night for me! ABC2 are showing all the episodes of the first season of Please Like Me back to back tonight, before the new season starts on Tuesday. But that’s not all…I also managed to get hold of the second last packet of Daiya mozzarella at Mad Cowgirls this morning. And H has made a cake. Banana and chocolate with cream cheese icing. I LOVED the first season of Please Like Me when it aired last year. The series only had 6 episodes, so it was over before we knew it, and I was worried we’d never see it again. But somebody else must have loved it too, because it was picked up by a US cable network, and now it’s back – and this time there are 12 episodes in the series. Yay! I’m all set for tonight: beer, pizza, cake, Fry’s Chocolate Cream bar and the remote control under my control. 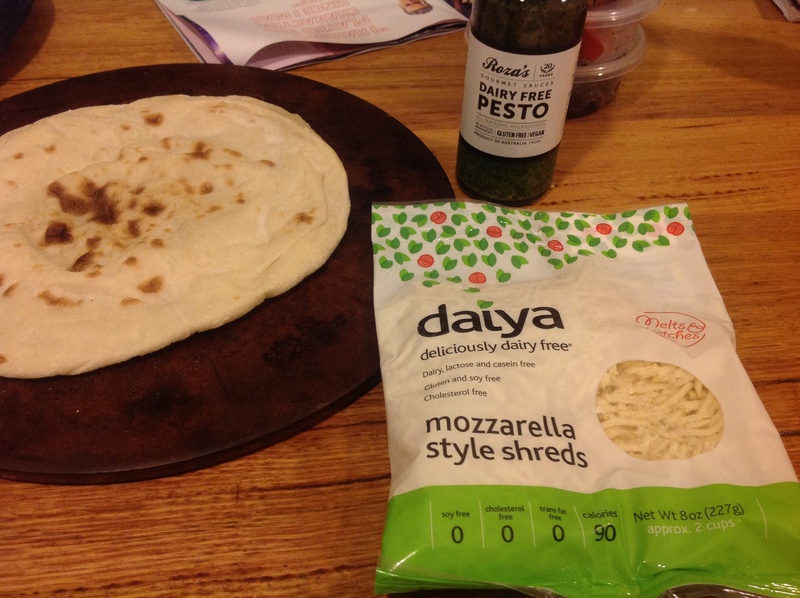 I’ve heard such good things about Daiya, I was pretty excited to try it out. So far, the best mozzarella I’ve tried is Notzarella, which is good, but I’m happy to do without it. 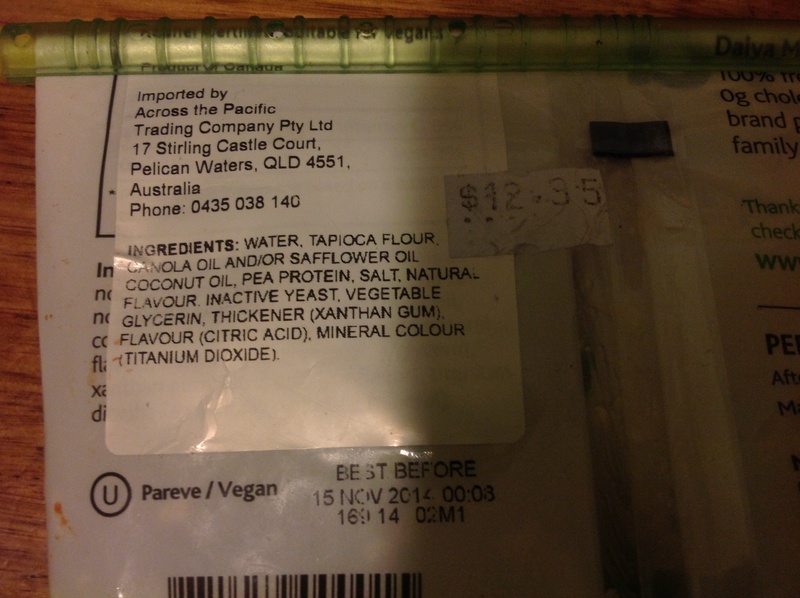 The ingredients in Daiya surprised me. There’s nothing hideously chemical or toxic-looking. It’s pretty much made of food, which is a good start. We all made up our own pizzas. 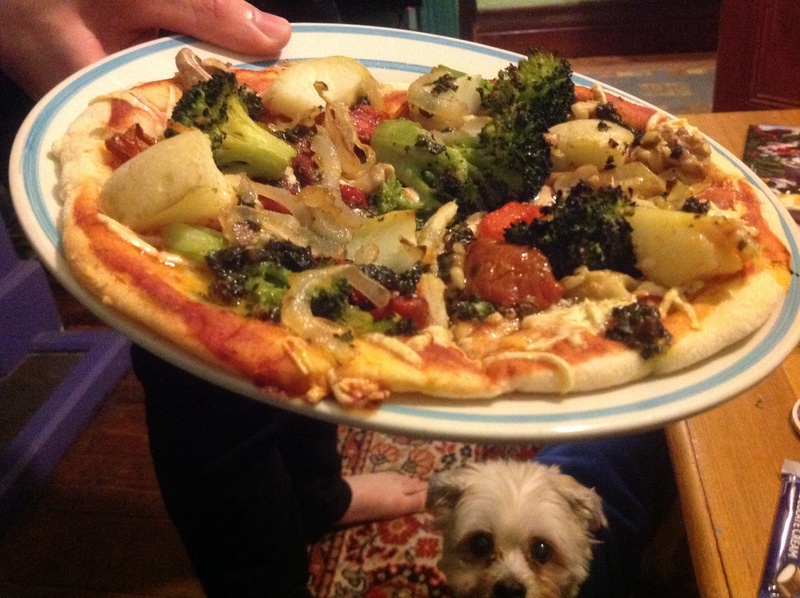 I added tomato puree, Daiya, caramelised onion, roasted capsicum, steamed broccoli, semi-sundried tomatoes, potato, walnuts and a dab of dairy-free pesto on top. The Daiya browned nicely and had a little bit of stretch, but I’m sad to say it was a little bit pasty. I think the thing is, that I’m over needing mozzarella now. If I refuse to eat the thinly sliced mozzarella I used to buy at the market in my dairy-eating days, I’m happier to eat a cheese-free pizza. I reckon that caramelised onions and/or olives and/or a little bit of truffle oil give my pizzas the decadent, salty, oily taste even better than cheese does. Daiya and Notsarella are OK, but I probably wouldn’t go out of my way to buy them again, unless I was making pizza for someone who couldn’t do without cheese of some kind. Cocoa (our dog) was hanging around waiting for some of the pizza to drop on the floor. After the pizza, I cut myself a small piece of H’s new favourite cake. We had lots of over ripe bananas to use up, so she veganised the Chocolate Banana Cake from the Joy of Baking, using egg replacer and soy milk. 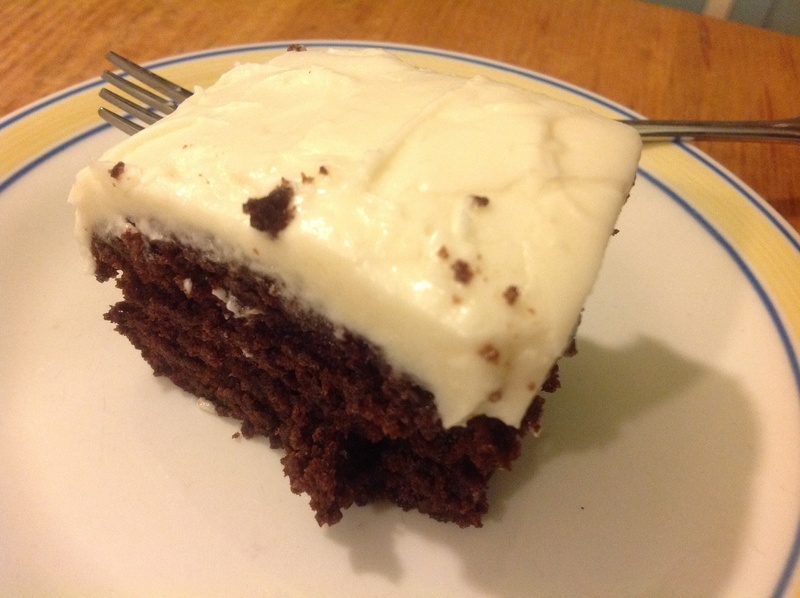 Instead of the ganache icing, she made a cream cheese icing from Tofutti cream cheese. It was lovely and moist and chocolatey. Luckily her brother loves it too, so we’re encouraging him to eat it, so we don’t end up devouring it all. I could probably polish off the lot in one evening if someone didn’t stop me! Might just curl up on the couch and hope someone wakes me at 8.50 pm for the show. Ha, I must have bought the Daiya mozarella before you today! I haven’t seen Please Like Me so I’ll add it to the list of shows to check out. Haha, doesn’t surprise me. It seemed like half of Melbourne was in there yesterday. I’ve never seen it so busy! I liked the new series but am less excited about the second – probably partly because E is not so keen on it which makes it less fun. I do like Josh Thomas and might have watched it if we didn’t have a rare Saturday night out. Hope you enjoyed it. The daiya mozzarella is my least favourite of the three. I think Notzarella is better. But the pepperjack is great for grilled/toasted sandwiches and the cheddar is fabulous in mac cheese. Perhaps I will go back and get one of the others to taste test too…if there are any left! I’m a big fan of Daiya and don’t like cheeseless pies but I recently bought “The Non-Dairy Evolution” cookbook because pals are swooning over it! Check it out. Your pizza looks amazing. Obviously Cocoa thinks so too. I found Like Minded Projects!